Italy’s Deputy Prime Minister Matteo Salvini launches his campaign for the European Parliament elections today when he unveils his cross-border alliance of populist groups. A dominant force in Italian politics, Salvini is the leading light among a new generation of nationalists from across the EU who’ll join him in Milan. They’ve targeted the bloc’s elections in May as a chance to tear up debt rules, get a grip on the European Central Bank and start a rapprochement with Russia. Democratic Erosion | Poland’s clash with the EU over the rule of law will be front and center at the bloc’s top court today. The European Court of Justice will hear arguments by both sides on the legality of Poland’s sweeping judicial reforms, an area over which the government in Warsaw argues Brussels has no jurisdiction. Tech Fines | European lawmakers will vote today on new online terror content removal rules under which Google, Twitter, Facebook and other tech firms could face fines if they fail to eliminate terror propaganda from their sites quickly enough. The rules are part of broader EU effort to make platforms more liable for what users post. A.I. Ethics | The European Commission will today present a set of guidelines around ensuring artificial intelligence software is developed and deployed in an ethical, fair way as it seeks to distinguish itself from how the U.S and China approach the technology. The framework, devised by outside experts, may form the basis of future regulation. Venezuela Divisions | EU foreign ministers will discuss the worsening outlook for Venezuela over lunch in Luxembourg, with the 28-nation bloc still too divided to expand sanctions against President Nicolas Maduro’s regime and only a month left in the 90-day mandate of the International Contact Group seeking to steer the country toward new elections. No Japan | Europe’s sclerotic growth and political dysfunction inspire frequent comparisons with Japan’s lost decade from the mid-1990s. But economists insist there are limits to the comparison, even as they acknowledge that a prolonged period of European stasis, deflation and central bank impotence remains a threat. Estonia’s Coalition | Estonia moved toward a new governing coalition that includes a controversial anti-immigrant party. The result risks further eroding unity inside the world’s largest trading bloc, where the rise of nationalist politicians has prompted clashes on issues from migration to democratic standards. Swedish Purge | The culture that allowed one of Sweden’s most important financial institutions to become part of a vast Russian money-laundering scheme has driven investors to demand drastic changes. The Swedish Shareholders’ Association is now questioning the basic culture of Swedbank and says it shouldn’t be allowed to appoint a new leadership from within its own ranks. Once again, the day Britain is set to leave the EU without a deal looms. And once again, pound traders are barely batting an eyelid. 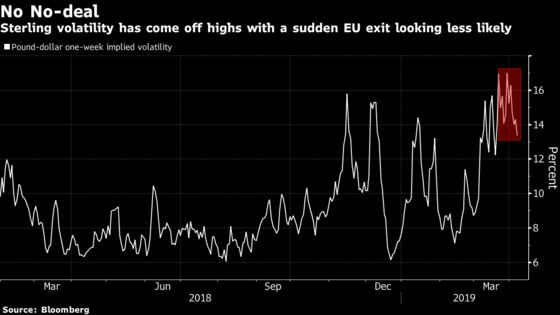 Sterling may get a temporary reprieve from the Brexit frenzy if the EU grants the U.K.’s request for a further extension next week, allowing it to extend this year’s best performance among Group-of-10 currencies.